The Cochin International Airport has become the world’s first airport to generate all the power it needs from solar technology. Bosch Limited was the implementation partner that helped the airport set up a 12 megawatt solar station in the premises. The unit will produce 50,000 units (kWh) of power per day. 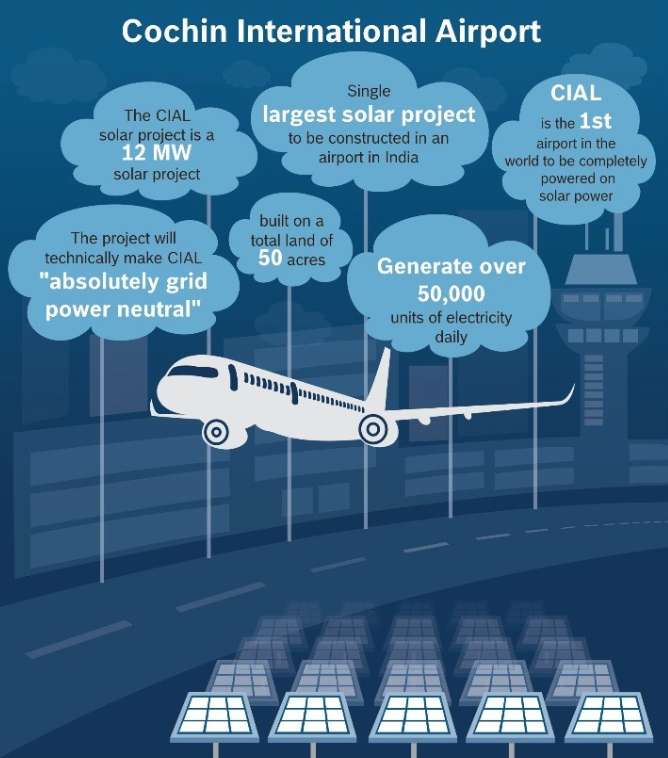 Constructed on a land of 50 acres, this is the single largest solar project which has been constructed in an airport in India. Through this project, coupled with an earlier installed capacity of 1.1 MW, CIAL will technically become ‘grid power neutral’, Bosch said. India is one of the world’s best candidates for generating much of its power from solar sources. However, lack of investments have kept the country backward in this area so far. The government has a target of installing 100,000 MW of solar power in India by 2022. “India has the potential to achieve the government’s ambitious target.. by 2022 and Bosch is committed to be a part of this success story,” said Dr. Steffen Berns, managing director Bosch Limited. He said the Cochin Airport installation is the largest project which has been executed by the Bosch Energy and Building Solutions team in India till date. Designed entirely in-house at Bosch, the project was driven by a dedicated engineering team and supported by full time quality and safety experts working onsite. In India, Bosch Energy and Building Solutions is involved in executing solar PV-and energy efficiency projects. Within 2 years of being set up, the unit is either working on, or has completed projects amounting to 50 MW of solar power generation capacity.